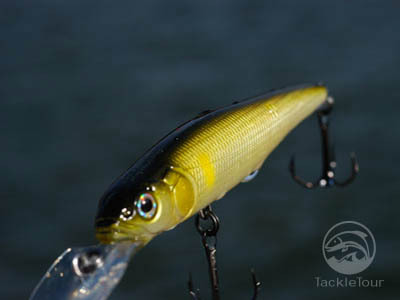 Introduction: Nothing gets the collective juices of the TackleTour editorial staff flowing faster than word of a hot jerkbait bite. Nothing, that is, except for word of a new jerkbait to test! Ever since the debut of our Megabass Vision 110 review in December of 2005, we've been on a mission to uncover all we can within this segment of one of Japan's premiere tackle manufacturers. 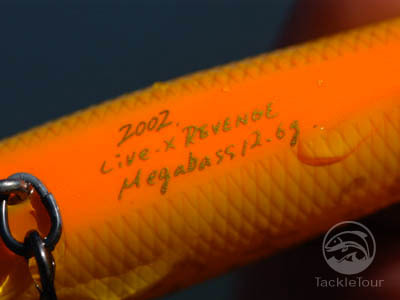 Today, we bring you the latest of our discoveries, the Megabass Live-X Revenge. 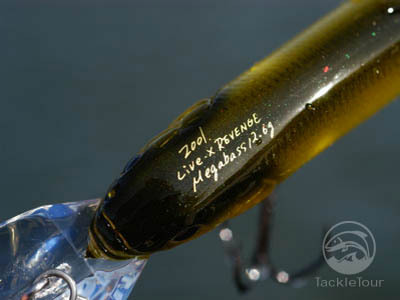 Impressions: While certainly not new to market, the LiveX Revenge represents Megabass' mid-range suspending jerkbait. It is a tad shorter than the Vision 110 at 90.5 millimeters and only three-eighths of an ounce. 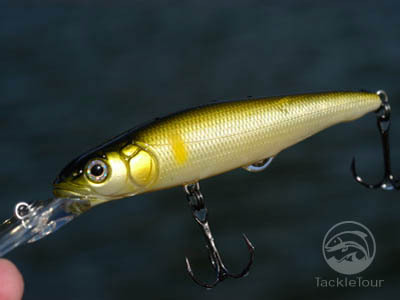 It's body has a more traditional minnow shape and its bill more pointed than round. The great thing about the LiveX Revenge is, at least for now, the bait is easier to obtain than the Vision 110! 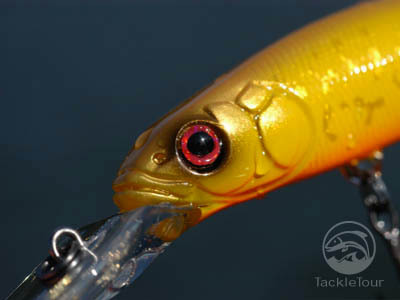 But of course, because of its deeper running nature, each bait targets fish in a different range. Introducing the Megabass LiveX Revenge. The Field Tests: I threw the LiveX Revenge on and off from about Fall of 2006 through the Spring of 2007. My rods of choice were both a Megabass F4-610XDti Elseil, winner of our 2006 SuperCast Import Rod Shootout, and a custom wrapped G.Loomis MB843C GLX built by Matt Davis of Otterods. Both rods were matched with Daiwa TD-Ito 103HL's and 10lb Yozuri Hybrid. The Revenge sports a rather ordinary shape and profile by Megabass standards. No special scoops, cut outs, or contours here. Casting: The LiveX Revenge weighs just a hair under half an ounce and thanks to its moving balancer system, casts incredibly well. I fished this bait off of rocky bluffs, in and around dock pilings, amongst scattered groups of tules, and around submerged weedbeds and never really thought twice about placement. Maybe it was the benefit of my über-enthusiast combo's, or maybe it was the difference between casting a three and a half inch bait versus an eight inch bait, in anycase, all I had to do was identify my target and fire away. The #6 hooks of the LiveX revenge are spaced far enough apart that tangling during casts was a non-issue. It lands in the water poised and ready for action. 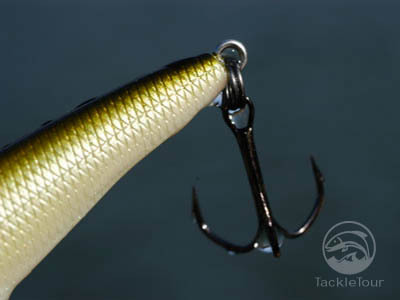 ... though each bait does feature the Katsuage outbarb hooks. 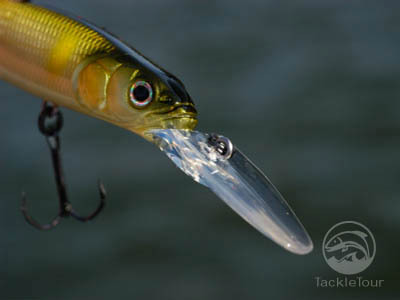 Action: The secret with any bait, really, is in its action, but this is even more important with hard bodied jerkbaits. Do you need a hard jerk to get them moving or can you get results with just a soft pop of your rod tip. How do they behave when ripped hard in the water and what do they do on the pause? 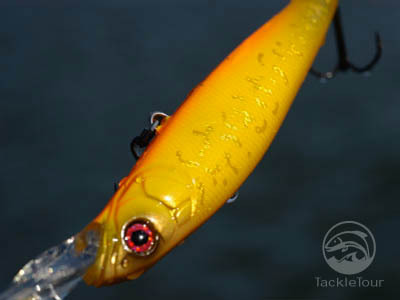 The Vision 110 has a pronounced wobble when jerked that gives off quite a bit of flash, but its actual movement in the water is limited when compared to other baits. The Lucky Craft Pointer series glides from side to side, but doesn't flash quite as effectively as the Vision 110. Both baits are proven and very deadly. So what's the story with the Live-X Revenge? It has a hybrid bill reminiscent of the Lucky Craft Bevy Shad, yet a relatively long body with very little definition as compared to the Vision 110. 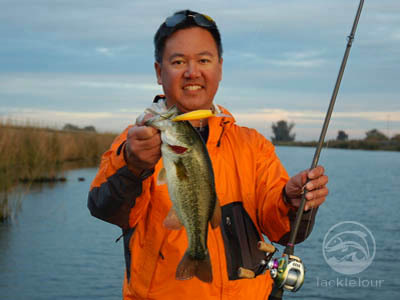 When retrieve in the water with a couple of quick jerks, the bite or resistance it provides is quite impressive and the bait wastes little time diving down the water column. But that's where the confidence inspiring action sort of wanes. Witnessed in clear water you can see the LiveX Revenge dive down confidently, but its action, when jerked is actually not very erratic. The LiveX Revenge has a bit of a hybrid lip. 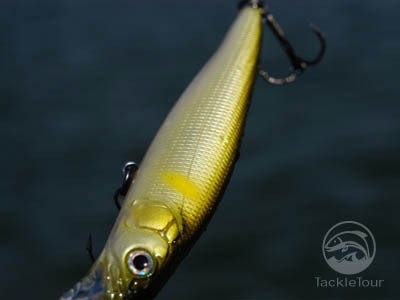 The lip takes the bait down to approximately six to eight feet. Instead of dashing side to side like most jerkbaits, or even zig-zagging in the water like others, the LiveX Revenge comes back in a straight line. When you pause your jerks, it stops with the best of them and simply hangs there drifting in the current, but its lack of any significant side to side motion is puzzling. Closer inspection reveals a finely detailed head. Bright and attractive in color pattern IYB. Durability: Other than normal wear from the hooks and a few fish, we ran into no durability issues with the LiveX Revenge's finish. The ultra sharp Katsuage outbarb hooks it is supplied with remain sharp through a season of catching, but it should be noted these hooks are very thin gauge and susceptible to being bent. The LiveX Revenge is easier to source than the Vision 110, but of course, it's a totally different bait as well. Gotta love the flaring nostrils and red eye combination! 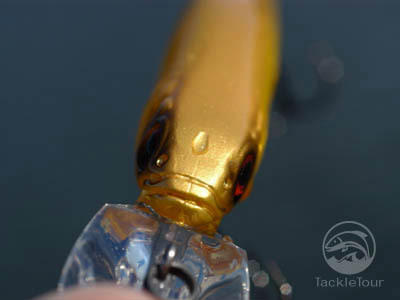 Application & Effectiveness: As mentioned previously, the bite these baits provide in the water is impressive, but their lack of motion is puzzling. 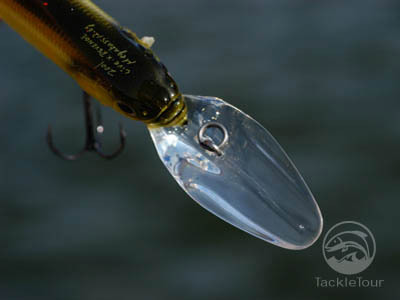 What we found is, this bait seems to work best in somewhat pressured or low wind conditions when the bite on other baits seems to slow. 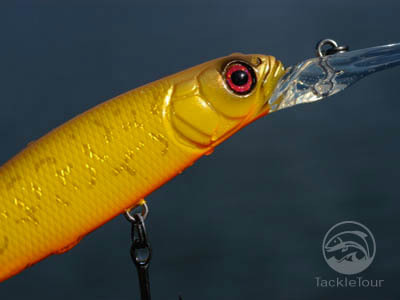 It's kind of between a finesse jerkbait and a standard one because it has the subtle motion of a finesse bait, yet, the internal rattle system of all the others. New to us, but certainly not new to market, the LiveX Revenge. It may not be a bait for all conditions, but getting a fish on the other end of the line is what it's all about! Conclusion: Well, the LiveX Revenge is no Vision 110, but we get the impression it's not really meant to be. With more of a straight back retrieve than an erratic side to side flasher, it's a tough bait to gain confidence with yet, under the right conditions, it does produce. Those conditions? When the wind is just picking up and there's a very slight ripple on the water. Anything less to anything more, and we had a tough time hooking up with this bait. 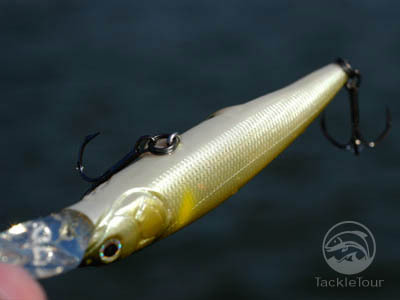 Get a couple to compliment your jerkbait arsenal because its action is rather unique, but don't rely on it to fill out your livewell if money is on the line.